What It Is: One of the more unique subscription services I’ve come across! 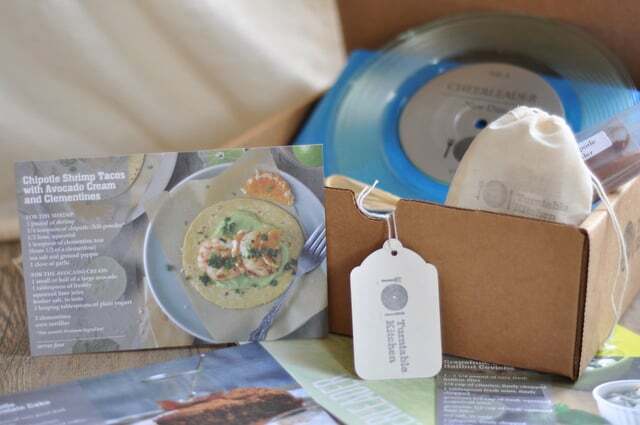 Each month, Turntable Kitchen sends out an exclusive 7″ vinyl, a digital playlist so you can listen to their curated tunes anywhere, three recipes, a couple of primo ingredients to help you make the dishes, and ‘tasting notes’. It’s a fun collection to liven things up in the kitchen and beyond, elevating your next dinner party from drab to fab. Who It’s For: Your foodie friend, as a fun hostess present. Your culinary-minded sibling, as a great birthday pick. Your hipster spouse, to suit two of their key interests in one fell swoop. What It Costs: $25 a month. Shipping to Canada works out to an extra $5 a month. Where It’s At: Subscribe here. BONUS entry into last week’s YA beach reads giveaway! Tell me in the comments below – can you think of someone that might love this gift idea? What do you think of it? I think it’s such a cute idea, and surprisingly reasonably priced. It would be perfect for someone in a long distance relationship. I think this is a great gift idea! Really well-rounded and thoughtful. I would actually love this for myself! Well if I had to share – I would give to my daughter because she is a budding reader and just starting to get into those reads and then I can borrow them too! Very good idea for people that have everything. My sister-in-law would love this!!! I can’t see this concept working – I don’t have anyone that I know who would subscribe. This could be an interesting gift, actually! Hmmm, I’m a music lover & a foodie but this idea I’m not too sure about. Beach Reads: YA Edition bonus entry: I can think of a few people that might love this gift idea. I think it’s a great idea since it’s multifaceted. I think it’s a unique idea, however, I wouldn’t pay that much money each month. I have a friend who loves to cook and entertain who might be interested. My bestie would love this! My son-in-law would love this! Thank you! I love subscription boxes and this has to be one of the best I have seen. My friend Dirk would love this!